This one has the pearlized finish that we call irridescent. It's also available in a non-irridescent finish. 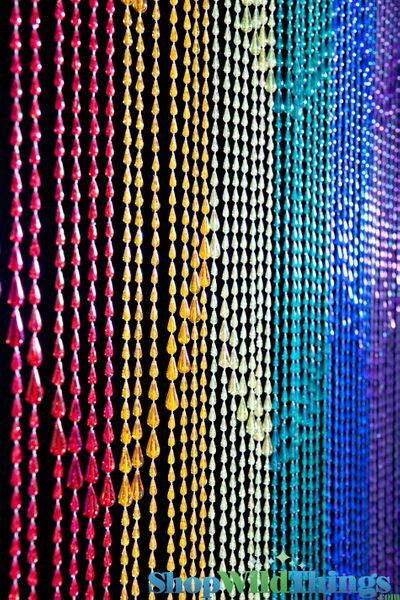 These beads are beautiful and the colors are very vibrant. I put them on the window and they sparkle when the sun shines thru them. Merchant Response:LOVE LOVE LOVE these photos! ProsThey can be cut with out raveling so I could customize them. 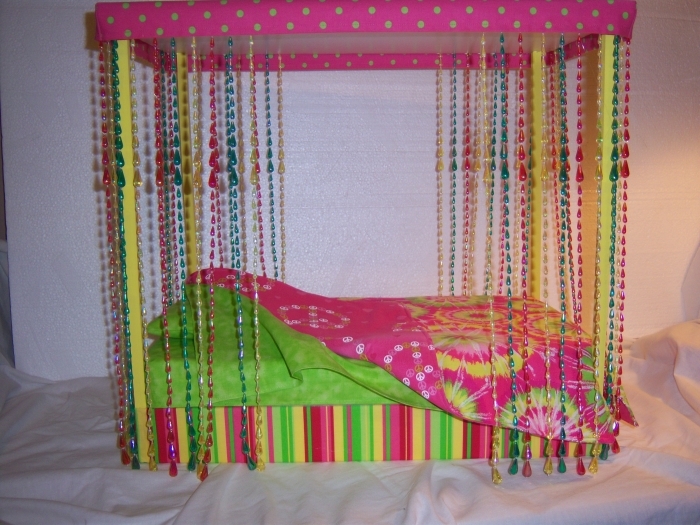 I make doll furniture and use this for beaded curtains around my American girl canopy beds. They work very well, and are inexpensive enough that I don't have to charge extra. They are a little difficult to take apart, which is a good thing for a buyer, but maybe not so much for me!!!! Merchant Response:Adorable! Thank you for sending in these photos and for reviewing the product. We appreciate you! Good quality, sturdy, attractive (nice shimmery look), easy to hang. This is exactly what I was looking for! Easy to hang, colorful and good price! Bright colors. Cute for a young girl. Love it! Just what we were looking for. My 12 year old daughter has been wanting this....exactly what she was looking for. Easy to install, just used 2 small hooks on doorframe. Easy to order, received within a few days, it had everything in the box to hang it, loved the product! Very nice product, looks great, easy to install! I have a studio apartment with openings instead of doors. The curtains are a beautiful array of colors that brighten up my little place and act as a barrier to places best left unseen! ProsEasy install. Nothing to it once I had the right hardware. Colors are bright and beautiful. ConsI did not purchase hardware with the curtains and they did not come with hardware. I would recommend anyone buying curtains to know if hardware is needed at the time of purchase. I used these at a birthday party for my granddaughter who was turning 5 with a my little pony theme. These were used to make a rainbow waterfall behind the cake table. Of course she wanted it in her room after the party. So decoration and gift! The look great. My daughter loved the curtain. She liked the raindrop beads & the way it sparkled when the light hits it. It was a perfect fit on her door & doesn't tangle when you walk through it. What a perfect compliment to my office without a door! Everyone loves it and politely asks permission to enter. Very good quality and wicked easy to hang. ProsSo easy to hang. Not tangled in the box or anything. Packaged perfectly!! My10 year old daughter wanted these for Christmas. We got her 2 sets. They are colorful and well- made. They come with everything you need to hang them (I wasn't sure about that). 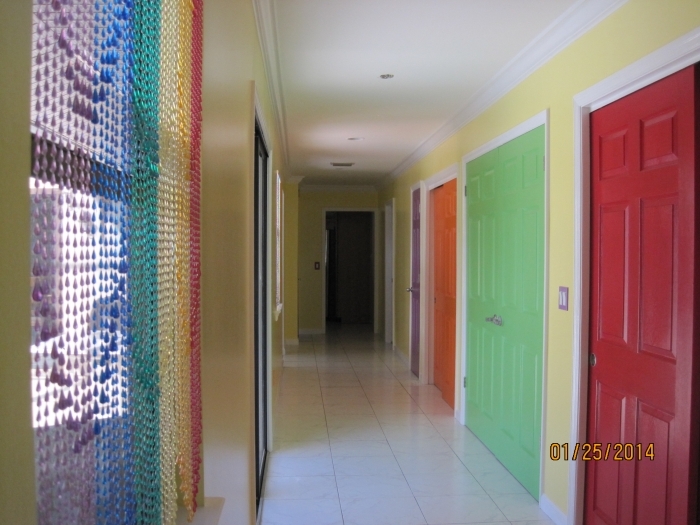 She has them on her bedroom and closet doors (both standard size) and they fit great with no excess. 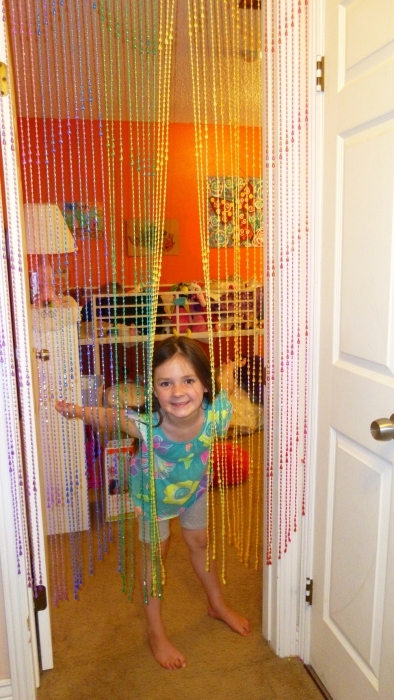 My daughter LOVES her new beaded curtain. We put it just outside her bedroom door. Very easy to hang. I was worried that the beads would be all tangled up, but the packaging was great, and it wasn't an issue. Great investment! Ordered them for my son. Love them the measurements where exact. Really look great hanging in my granddaughter's door. Excellent quality for this price. She's happy and loves them. If you want to surprise a little girl and create a memory she will talk about all her life, let her come home to discover these hanging in her door. This item was ready to hang right out of the box. Very little work on our part. We hung it on the outside of our back door. We leave it open for the dogs and cat come come and go as they please. At night the solar light hits it and it's very pretty. The purpose for buying this curtain was to disorintate the flies and skeeters that come in. some skeeters come through but the flies so far are staying away from it. I was afraid the dogs wouldn't go under it, but they don't mind it at all. Merchant Response:What a great review, and good info for the Dog Lovers who might worry about their best friend being afraid of Beaded Curtains. We, too, have found that they are great for dogs and for keeping the flying critters out! Thank you so much. This arrived and was exactly as ordered. It is very cute. We are using it in an entry doorway into a 10yr. play space. Would order again or more from this company. Arrived quickly as well. Thank you. ProsArrived on time and exactly as ordered. It was easy to install, just took it out and it was ready. 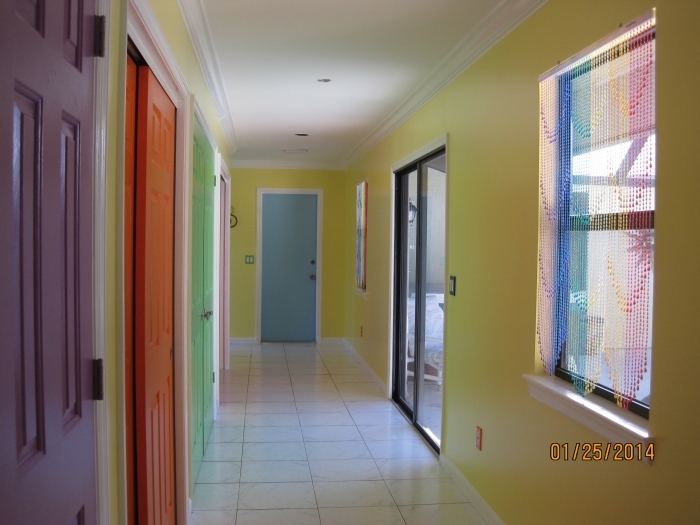 We wanted something to cover the doorway of a pantry that would still allow air to flow through. I broke my leg and couldn't get in with the doors on. 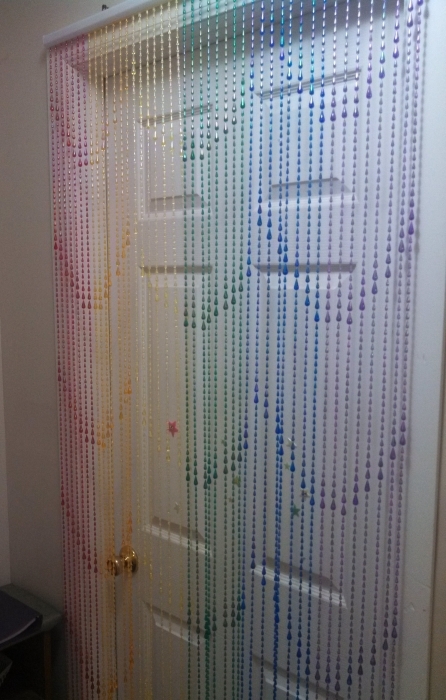 My son took the doors off and put the beads up. It helps cover my sometimes messy pantry. This product was awesome. Bought it for my grandaughter for Christmas. She loved loved loved it..
ProsGreat website. Arranged before I expected.. They are just as beautiful as we hoped! Using for the closet door of my 9 year old daughters room. The day we got them a younger friend barreled through and pulled 4 out :( we're working on try to re-thread them in. 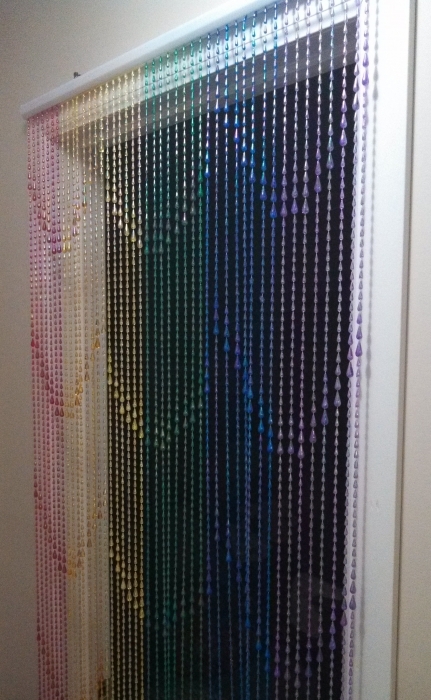 Question - can we buy additional beads to replace one that broke and also to fill in more so it's not as see-thru into the closet? Merchant Response:We would be happy to send you extra strands at no cost, please just reference this review and give us a call! We will just need to know which strands you need. Thank you so much. Great curtains; easy to install. Hung curtains over two White String & Sparkling Bead Mix Curtains and they look great! Nothing could be easier! Not only are they beautiful, they're strong, and so easy to hang. I bought 3 sets, one for the closet door, and two for the window covering. I was able to trim the window curtains with a simple snip. They look beautiful! ProsSturdy, easy to trim to size. I'm a kid of the '60s and this is a real flash back. Thanks for having them. I had looked everywhere - then you folks came along. Thanks again. Prosvery easy to put up and well made. My doorway needed this! Looks fabulous. ProsEasy easy easy to hang! They fit perfectly in the laundry/kitchen doorway. They are beautiful! They move softly when the kitchen fan is on and the added sparkle flashes when the kitchen light is on. Great conversation piece as well. We ordered the Curtains for our Sensory area of our Adult Day program for Adults with Special needs!The curtains were good Quality, easy to hang and look great hanging on out windows! A BIG hit in the program area! Bought this for my 10 year old daughter, she loves them. It's actually better quality than I expected. Worth the price, should last a year or two. bought for my 10yr old daughter, She loved em! ordering was easy, shipping came on time. Product was built with quality. Merchant Response:We are so happy that you love the product and service. We've found that most people don't want them going all the way to the ground because then you have to "kick" through them. We've gone back and forth about what the best length is. 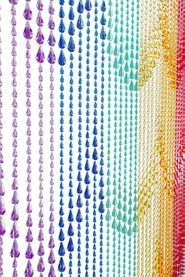 If you find that you really prefer a longer look, you can purchase a 9' long curtain and trim the extra length off of the beads to exactly the length you want! Thanks for your comments and for your business! Consdoes not go all the way to the floor. ends about 1.5 feet from floor. The product came when expected and was very easy to install. My 11 year old loves it! !